This interesting surname of English origin is a dialectal variant of the locational name Helford in Cornwall, deriving from the Welsh "heli" meaning "brine" or "haler" "salt", hence "salt river" plus the Old English pre 7th Century "ford" "ford", thus "ford over the river Hayle". The surname dates back to the mid 16th Century, (see below). 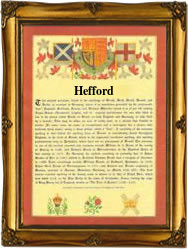 Variations in the idiom of the spelling include Efford, Hefforde, Heford, Heffort, etc. One Katherne, daughter of Anthony Hefford, was christened at St. Michael Bassishaw on November 30th 1561. William Heford married Elizabeth Simson on October 8th 1599, at St. Stephan Coleman St., London, and Joanna, daughter of Thomas and Margrett Hefford, was christened on February 6th 1675, at St. Botolph without Aldgate, London. One Nathan Heford, an emigrant to the New World, sailed aboard the Planter bound for New England on April 2nd 1635. The first recorded spelling of the family name is shown to be that of Willmus Efforde, christened, which was dated 1543, at Landulph, Cornwall, during the reign of King Henry V111, known as "Good King Hal", 1509 - 1547. Surnames became necessary when governments introduced personal taxation. In England this was known as Poll Tax. Throughout the centuries, surnames in every country have continued to "develop" often leading to astonishing variants of the original spelling.